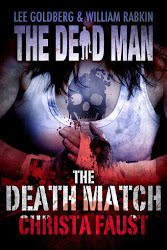 Christa Faust uses her background as a mixed martial arts enthusiast for The Death Match. I’ve been a fan of Ms. Faust ever since picking up a copy of her novel Money Shot in a Boarder’s bookstore (which closed a few months later). Lately she’s written adaptations of TV shows (Enigma, Supernatural) for novelization, while creating her own original novels. A fan of classic noir fiction, she has all the right influences. In The Death Match, Matt Cahill travels with his ax of justice to Long Beach, California. He’s read an account in a newspaper of a dock worker who was found partly eaten. Gruesome enough, the man’s photo in the paper showed an Ouroboros tattoo on his arm. The same symbol found on the ancient Anasazi altar the archaeologists where excavating before all hell broke loose in The Blood Mesa (#5). Mr. Dark, the supernatural villain of the series, has left a calling card and Matt needs to investigate. This is the first of the series to reference more than one of the other episodes. The Ouroboros first seen in #5 and the death match scenario was used in Ring of Knives, #2. By this novelette, no story arc has developed, but Death Match shows it can happen. The major focus of the book are the two women MMA fighters. Matt Cahill becomes a supporting character as he races around after them, trying to prevent more carnage. Zombies make an appearance, always a sure-fire way to get the readers’ attention. There’s also plenty of violence. I’m hoping the author will return for another Dead Man outing. She’s done her share of novel adaptations and this series is a perfect medium for her.